Accidents will certainly happen. The only time it is acceptable to shout is if you catch the puppy in the act of sniffing in a corner, or beginning to circle as if to squat, or actually squatting. You give a firm ‘No’, and immediately pick him up and take him outside or to where he should be eliminating. Remember more praise when he does go outside. If you can’t catch your dog in time and find the accident later, do not drag your dog back to the spot and rub his nose in it. He has no memory of doing it and dragging him back will only scare him. You’ll want to eliminate the odour immediately If your puppy can smell the spot he will be drawn to it again. Secondly, try to figure out what you did wrong. Was he just fed? Get up from a nap? Playtime? Understanding what your puppy was doing before he went will help you plan for the next time. If you keep you puppy in a crate at night, first thing in the morning, before you take care of any of your own needs, go to the carrier, and take your puppy outside. Stand with him as he eliminates, and praise him. After he eats, pick up the bowl, and take him back outside and see if he has to go again. Don’t forget to keep the praise up. After he is done, plan on around 15 minutes of good exercise outside. If you stay at home, try to pay attention to your dogs activities. If you are at work, try to get someone like a friend to do this midday feeding and elimination schedule. Mid afternoon, another bathroom and exercise break. Dinner should be around 5-6 PM, so that the pup has several hours in which to empty himself out before bedtime. Take him out just before you go to bed. Lastly, put him in the crate for the night. You can also try paper training. You will know things are going well when your puppy begins to ask to go outside. Pay attention to your dog. If you ignore him, or don’t understand what he is trying to tell you, he will continue to have accidents even though he knows where he should be going. This signal usually starts to be given after 1-2 weeks of consistent housetraining techniques. Once he is regularly asking to go outside, you don’t have to accompany him each time. 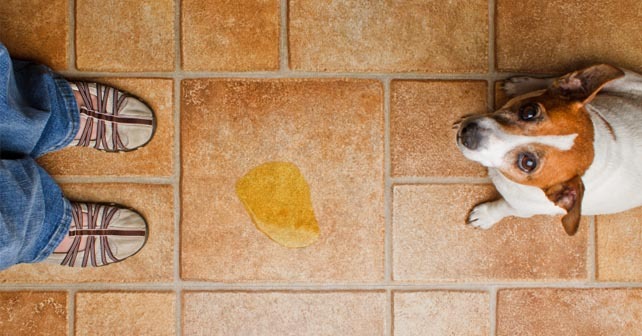 You can consider your pup to be housetrained if he goes 4-8 weeks without any accidents in the house. Then, you have the option of leaving food down all the time, and letting him free-feed, and also of not using the carrier, and letting him sleep wherever your would like him to.